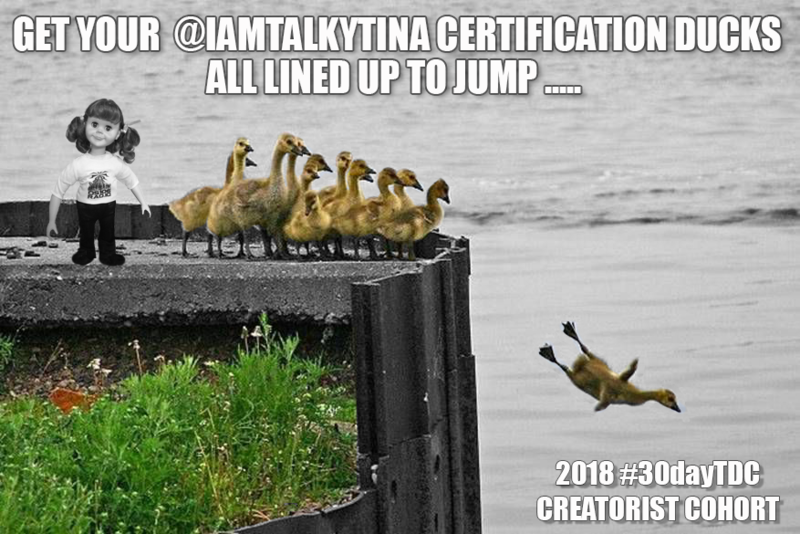 So, we are 10 days into the June 2018 30-Day The Daily Create Challenge and you are wanting to stay on track to receive your @iamTalkyTina Certification in Creatorist as part of the June 2018 Cohort. Do all 30 of the June 2018 The Daily Create challenges. Do not skip a single one. Be sure to sign up on my 2018 web form so that I know for sure that you are wanting to attempt certification as part of the June 2018 Cohort for @iamTalkyTina Certification in Creatorist. Consider keeping track of all 30 of your submissions (it helps to speed up the confirmation process, so you get your badge faster) using a handy tracking page, like I do. a electronic Google-calendar that you can subscribe to so you can get special alerts every day. Again, I will not be bugging you to do your work. If you want your badge and all of the pride and recognition that goes with achieving it, then you have to put in the effort yourself. But you can rest assured that the prize is worth it in the end. Just ask the people who completed the June 2017 Cohort for @iamTalkyTina Certification in Creatorist. They all have that confidence of having completed the program and the pride of knowing that they earned their badge. This entry was posted in Certification, ds106, friends, The Daily Create and tagged @iamTalkyTina Certification, 2018 Cohort, 30DayTDC, badge, calendar, Creatorist, June2018, June2018 30 Day Challenge, the Daily Create, tracking page on June 9, 2018 by iamTalkyTina.